Why does it sometimes seem so hard to be happy? Yeah, I’ve also asked myself that many times. Maybe you, like me, have reached the point where that famous “comfort zone” just isn’t enough anymore. It’s actually become an “uncomfortable comfort”. Or maybe, deep down, you just have that feeling that there must be some way to feel better in life. If so …Kudos! to all you out there, who like me, dare to question things, want to figure out how to be happy, or at least want to try! Finding yourself here, reading this post, is a good sign and means that you’re willing to change. Which is Awesome, because I’ve prepared a few tips that’ve already begun to help me (being happy is a day-to-day job). I’m sure that if you start practicing them, being scientifically proven, you’ll get there too. Life is too short to sit around and wait naively for that perfect moment. Thinking that happiness is just gonna fall from the sky, and walk into our lives in some form of money, opportunity, or that special someone. 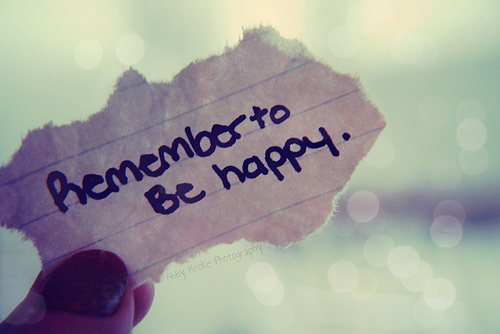 And that by simply embracing that moment we’ll gain the strength to: “start being happy!” NO. Happiness is amuch longer, deeper journey, and it’s way more rewarding. Being happy is a daily decision, and just like any other habit, you’ve got to internalize it, which requires constant commitment. So, first have the INTENTION, be willing to step outside your comfort zone, leave old habits and negative thoughts behind, and finally start making those simple changes that are gonna enable you to become a happier person day-to-day. That is, stop looking for happiness and start living happiness. A study by June Gruber (Yale psychologist), suggests that constantly seeking happiness can actually generate anxiety. This happens when those who seek it,assume that if they do everything that they’re “supposed to do” to be happy, they WILL automatically be happy. The problem is, they don’t know how to deal with frustration if the results don’t appear in a timely manner. So, the truth is:happiness isn’t the result of doing just one thing, but of a change of lifestyle, and we don’t always get it magically by snapping our fingers or with a twitch of the nose. 2- CHANGE THE PARADIGM: success doesn’t bring happiness. So, in order to be happier, try to leave that blind ambition behind. If you find the passion and fulfillment in what you are and do first, the check, the car, the status, and all that stuff will come later. 3-SURROUND YOURSELF WITH POSITIVE PEOPLE. Happiness is like a cute little disease or virus that floats around us. When we’re around positive, grateful, enthusiastic people, we “catch” their special energy. What’s even better, is that it makes the day spent with them more enjoyable, more rewarding, and even more productive. A study by BMJ Group concludes that people’s happiness depends largely on the happiness of the people who they are connected to and that it can even be a collective phenomenon. Whether it’s taking a trip, taking on a new project, starting a relationship, throwing a party, or even choosing a restaurant for dinner, with these people, everything becomes too complicated and the day seems to be full of obstacles. These things definitely don’t help us to grow or move forward. Basically, they don’t add anything to life of someone looking for happiness. You know how water gets when it stagnates and doesn’t flow freely, the same thing happens with the energy that surrounds us and the situations we face. Warning! With my last point, I don’t want to mix up “denial” with optimism. It’s also not a good idea to surround yourself with people who deny reality, problems, or the stones that every path contains, because life is full of good and bad things. However, the important thing is how we deal with those situations. Positive and optimistic people don’t deny the problems, or an unpleasant reality, they have enough self-confidence to know that they can change the course of events, and transform a sad, painful moment, or even a failure into an experience that will make us wiser, or stronger, and keep moving forward. Why are we so foolish and deprive ourselves of living in the moment? Today you’re healthy, today you’re drinking that hot, delicious coffee, today you’re all bundled up, today the sun is shining, today you can breathe, today you have a partner to hang out with, a friend who calls you, a boss who encourages you, today is today. Ask yourself, “Will I still have all these things tomorrow?” Well, … We can’t answer that for sure, but certainly, by living in the past or worrying about the future, we lose the life we have today, which is perhaps the life that has the power to make us happy, but we just aren’t able to realize it. Being physically active throughout your day, changes your day. If you feel tired, you’ll feel more energetic, if you’re worried, you’ll feel less stressed, if you don’t like your body, you’ll like it more. Even if you suffer from insomnia, you’ll be able to relax and get some sleep. These things also lead to being in a better mood, more lucid, and more focused. Exercise can also work in very powerful ways and even be used to calm anxiety disorders. A study conducted by Daniel Lenders, from Arizona State University, suggests that exercise works better than relaxation, meditation, and music therapy for anxiety episodes. Similarly, another study was conducted through which it was proven that even without losing weight, people who were given an exercise routine of 6×40 minuteshad a better perception of their body afterwards compared with the group that was assigned readings. Likewise, the benefits of exercise go beyond their effect on the body. A study has shown that people with depressive disorders were taken off drugs and were given different exercise routines instead. Afterwards, they showed high rates of recovery and, most importantly, low relapse rates, compared to those who continued treatment with medication only. Ok, I know, on a cold winter day, or after a hard day of work, of course it’s easier to hang out on the couch, “relaxing” with a latte, watching your favorite show or reading your book. I’m not saying this is bad at all, but what’s not good is if you ALWAYS choose this option. For those you who need to change the energy of your day, and a coffee, a beer, or a couch, doesn’t sound good to you, exercise is the best antidote. Although initially, it’s difficult to gather the courage to go out for a walk, a run, a bike-ride, on a frosty morning, or a really hot afternoon, after solving all those problems of a long day. But, if you eventually get motivated to do so, the feeling you’ll have on the way back home will be fantastic, I promise. You’ll feel stronger, more alive, healthier, and more powerful, because you will have managed to do something you thought you weren’t going to be able to do. It’s a step in the right direction. Try it, it’s part of this beautiful day-to-day job to becoming happier. This is where I feel most comfortable because I’ve never really missed the opportunity to give thanks. It’s not only important to give thanks to other people, but to life, to the universe, or to whichever God it is you believe in. It’s like the more grateful you are, the more life rewards you with the stuff that makes you grateful. Expressing gratitude is also a way of being focused on the present, it’s an act that takes place in the moment, and enables you to live life in the now. By giving or saying thanks, your conscience must be aware of each of the things that is happening to you and what you have. It may seem silly, but to me it’s essential to be grateful for having all my limbs: two legs, two arms, two ears….ok, those aren’t limbs, but you catch my drift. When I do it, I automatically feel relieved and happy, everything falls into place. Cause if I want to, I can go for a run and be free for an hour. I can see, I can smell, I can hear, I can taste the world’s flavors, I can feel the texture of things, etc… And that is truly priceless. Haven’t you ever sprained your ankle or burnt your finger and realized that your whole day basically becomes a living “hell”? Leaving my humble experience aside, studies have confirmed the great impact gratitude has on our emotional well-being. The Journal of Happiness Studies examined the effects of writing “thank you letters.” This study consisted of having 219 people write one thank you letter per week for three weeks. The results suggest that consciously focusing on what we have to be grateful for has a beneficial impact on an emotional and interpersonal level, therefore increasing satisfaction levels and decreasing depressive symptoms. Which is why, never stop being grateful. Stop for a just a moment and jot down on a piece of paper at least 4 good things that happened today. What went well inspite of everything: no one yelled at you at work, your son got an A on his math test, you lost 2 pounds, an important business deal was closed even though it was really really hard, etc. etc… Oh, and don’t forget: Your limbs. All this will help you become more conscious of just how lucky you are, and help you start the next day with more energy, ready to face those obligations of daily life. With this tip, I discovered something which I hadn’t really thought about before: too often we’re so focused on our chores, businesses, worries, etc, that it seems we haven’t got time for anything else. But, apparently when we devote a couple of hours a day to other people, our perception of time seems greater. Cassie Mogilner, who studies happiness, specializing in time management, at Wharton School, came to the conclusion that: “giving your time to others can make you feel more “time affluent” and less time-constrained than wasting your time, spending it on yourself, or even getting a windfall of free time”. Whether it’s doing volunteering work, being someone’s mentor, helping a colleague, or lending an ear to a friend, these types of activities increase your perception of time and result in lots of satisfaction. Nevertheless, beyond the time or the money, what matters the most are the effects on other people that these actions can generate. A simple gesture can make someone feel worthwhile, that they aren’t alone, and even more hopeful. Here’s a video that I hope inspires you each day, to not only do some things that are good for yourselves, but for others too. I hope these tips on how to be happy prove useful for you. Remember that you can start right now, so don’t hold out for the perfect conditions to start working on your happiness. They don’t exist. Happiness is an everyday choice, and you need to stop looking for it and start living it. To achieve it, you need to focus on the present and be aware of all that you have, feel, and can experience TODAY. We don’t know what’ll happen tomorrow, and the past is already gone…perhaps you already have everything you need to be happy right now and you just haven’t realized it yet. Enjoy every bite of food, every deep breath you can take, and every morning you can see the sun. If you are sad, tired, frustrated, anxious, I promise that gluing yourself to the couch, thinking about the things that make feel bad, will not change anything. Going for a walk, a run, or a bike-ride, is more beneficial than the comfort you seek on the couch. Take charge of your happiness and do something about it to feel better. Surround yourself with people who take you further as a person, who challenge you, who allow you to thrive in all aspects of life. Be generous with your time and your space, by helping others. You’ll never know what effects a simple action can have on someone else. ← Would You Encourage Your Sister To Become An Entrepreneur?